This sand colored 100% silk vintage evening jacket was made in India and it an Adrianna Papell Evening. 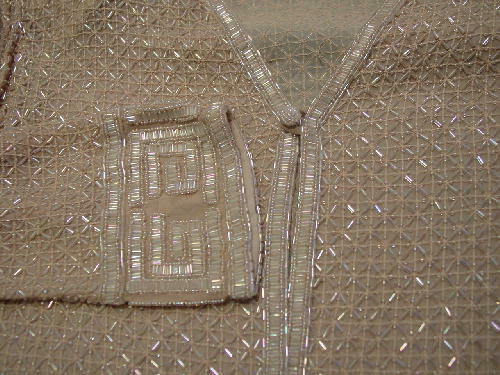 The one button closure is a small fabric ball covered in tiny iridescent beads and it has a fabric loop. It also has a hidden eyehook closure behind the beaded ball. There is a design pattern with elongated and tiny round iridescent beads. It has shoulder pads and long sleeves and it has quite a bit of weight to it. When buttoned, it has a 9" deep V neckline. It's nicely made with lots of detailing. The tag says size M, but it fits more like a size 4. It's from a French model who wore a size 4.
shoulder to hem 22 5/8"
bottom hem side to side (sides touching) 18 1/2"
armpit to armpit (button closed) 18 3/4"